Bored with your old 'do? Amp your locks with a splash of color carefully picked out for you. No matter how busy you, Cosmo girls, are, you need to find time to upgrade your look every now and then. As fun fearless females, looking good and feeling great is always top priority—and keeping your usual, safe hairstyle can get really old and boring. 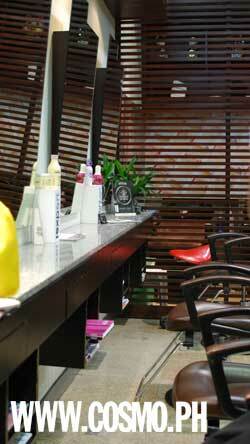 One of the things you could do is try a new salon, just to get a different styling experience. To help you pick out new salons to visit, this time in the Makati area, Cosmo trooped to Hairworks Salon located along Legazpi Street—a stone’s throw away from Greenbelt 5—to get a firsthand experience on their hair coloring and colored-hair care services. I wouldn't characterize my locks as virgin hair. But since I started working years ago, I opted to keep my hair as natural and uncomplicated as possible. I am not always too eager to take risks, and makeovers are no exceptions. So I really spent my first 30 minutes at Hairworks Salon consulting and debating with hair stylist and color expert Chrissy Calderon-Uy and stylist Rey Amorin, who both patiently walked me through what hairstyles and colors I could and could not have. In the end, we agreed that my grown mid-length bob would be chopped and texturized with layers and side-swept bangs. And for color, anything vibrant and drastic is a big NO—so copper and ruby shades were automatically ignored. I agreed to get the Signature Color Treatment (P6,160), which involves the use of two or more shades as base and highlights that could either add volume or minimize one’s tresses, depending on what you’d need. My natural multi-toned brown hair was lightened to give me a more mature look, one that now fits my age. I had a Light Ash Iridescent Blonde base and Very Light Mat Brown highlights, both from the Majirel collection of L’Oreal Professionel. I was also treated to pre- and post-coloration haircare from Pureology, to keep my treated tresses shiny and healthy. And to match my new hair, they even reshaped my brows to thinner, more defined arches, which were also tinted and lightened to the same shade as my locks’. The verdict: It was an experience that I did not expect yet turned out to be a blast. The choice of color for both hair and brows softened my facial features, hopefully lessening the suplada first-impression I’m so used to receiving. I also noticed that my hair felt soft and smooth from the haircare treatment. From here on, I’m bidding makeover jitters goodbye. My hair has always been, for me, boring: jet black, wavy, and sometimes difficult to style unless a hair stylist works on it (which only happens when I attend special occasions like weddings, debuts, etc). When I go to salons, stylists would often tell me “Ang kapal ng buhok mo! Bakit hindi ka kaya magpa-hair relax?” I would only smile and say “next time” because, really, I was worried that hair treatment will damage my hair. This time, when I was dared by Cosmo to get a hair color treatment, I was hesitant to agree at first, since, not only will it be my first time, I was also afraid of how I would look after the treatment. Nevertheless, I took it as a challenge: I was secretly longing for a new, more flattering hairstyle that will make me look more like the college student that I am. I asked stylist Chrissy Calderon-Uy, who attended to me, to suggest a hair color that will complement my skin tone. To lighten my facial features, she recommended that I try a chocolate base; that would also give life to my basic black hair, she said. Another stylist suggested that I add caramel highlights which will emphasize the texture of a new haircut. I was also treated to pre- and post-coloration haircare from Pureology, to keep my treated locks from drying--so I would have nothing to worry about. The ladies also gleefully offered to thread my thick, black brows and dye them to a lighter shade, which was, again, a “first” for me. If you're unsure which color to get, all you need to do is base it on your skin tone, as advised by Chrissy. If you’re olive-skinned or morena, which most Pinays are, opt for warm colors like brown. Mestiza girls with a pinkish glow can go bold and experiment with shades, from purple to the light mat and ash. Meanwhile, Filipino-Chinese girls, who often have luminescent and pale skin may go daring with yellow, red, and copper shades. Visit Hairworks Salon at Ground Floor BSA Tower, 108 Legazpi Street Legazpi Village, Makati City. You may call them through (02) 888-4819. See their other hair services on the next page.